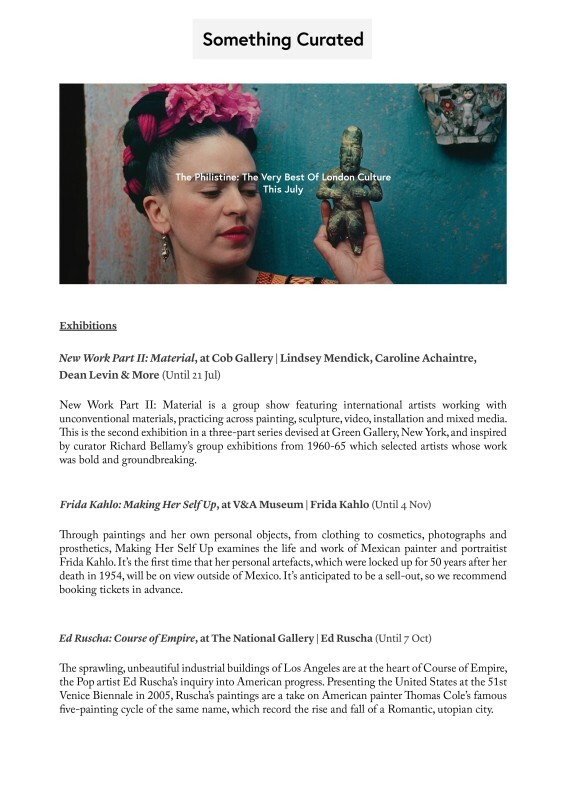 We’ve collated July’s most exciting cultural-happenings in London – from meditations on Los Angeles to two fantastic cinematic seasons, Frida Kahlo, and merry day-out in Soho, and the bright, unapologetic history (and future) of British independent print. There’s something for everyone. New Work Part II: Material is a group show featuring international artists working with unconventional materials, practicing across painting, sculpture, video, installation and mixed media. This is the second exhibition in a three-part series devised at Green Gallery, New York, and inspired by curator Richard Bellamy’s group exhibitions from 1960-65 which selected artists whose work was bold and groundbreaking.